Tamal Krishna Goswami served as ISKCON Governing Body Commissioner from 1970-2002, and ISKCON Initiating Spiritual Master from 1977-2002. In January 1972, he accepted the renounced order of life, sannyasa, in Jaipur. He served as India’s GBC Secretary from 1970–74 and as trustee of the Bhaktivedanta Book Trust, overseeing sales in the USA from 1977-2002. He is fondly called “Srila Gurudeva” by his many disciples and “Goswami” by his godbrothers and members of the academe. Born in Harlem New York, he began associating with the Krishna Consciousness movement in 1968 and was accepted as a disciple by A.C. Bhaktivedanta Swami Prabhupada in San Francisco, the same year. Immediately he emerged as a leader and assumed various positions of leadership. 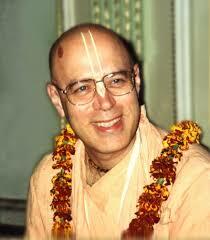 From 1975 until 1979, Tamal Krishna Goswami headed the “Radha-Damodara Party”. The party consisted of hundreds of Swami Prabhupada’s disciples, who traveled around America on buses, distributing Prabhupada’s books. He also spearheaded the establishment of ISKCON temples and centers in India, France, Great Britain and the United States. He worked closely with Srila Prabhupada as his secretary and as Governing Body Commissioner for India, developing major ISKCON projects in Vrindavan, Mumbai (formerly known as Bombay) and Mayapur. In 1972, he was awarded sannyasa, the renounced order of life, in Jaipur, India and assumed the title of Goswami, meaning controller of the senses. In 1974, Tamal Krishna Goswami returned to the United States to work on large-scale preaching programs, organizing and leading book distribution and the unparalleled Radha-Damodara Sankirtana / Book Distribution Party. In 1977, as on of Srila Prabhupada’s most trusted disciples, Tamal Krishna Goswami served as his personal secretary, during the seven months before Srila Prabhupada’s passing in the same year. In 1995, Tamal Krishna Goswami enrolled at Southern Methodist University in Dallas, Texas, graduating in 1998 with a B.A. in Religious Studies. He then moved to England to pursue a Ph.D. at the University of Cambridge, where under the supervision of Dr. Julius Lipner, he wrote his dissertation on the theological teachings of Srila Prabhupada. In 2002, March 15th, Tamal Krishna Goswami passed away in a vehicular accident in the sacred place of Phuliya in West Bengal, India. He left his life the same way he had lived it, completely absorbed in service to his spiritual master and Krishna. His Samadhi is placed besides Srila Prabhupada’s Samadhi in ISKCON Sri Mayapura-dhama, West Bengal, India. Tamal Krishna Goswami was a respected figure in the academic world and a regular and popular presenter at the American Academy of Religion annual conference. He was the author of several books on various religious subjects, including two collections of essays, two memoirs, a novel and two classical Vedic dramas. He was also doctoral student at Clare Hall, Cambridge, under Dr. Julius J. Lipner where his thesis was on the theology of ISKCON’s founder, A. C. Bhaktivedanta Swami Prabhupada. At the time of his death, he had completed all but the conclusion. This dissertation “A Living Theology of Krishna Bhakti”, Tamal Krishna Goswami’s posthumously released PhD thesis (with help from a professor of religious studies, Garuda Dasa (Graham M. Schweig of Christopher Newport University) is now a book published by Oxford University Press in New York. His lectures are widely distributed and help listeners understand Vedic culture and philosophy from a practical present-day perspective. Though no longer physically present among us, Tamal Krishna Goswami lives forever through his instructions, books, academic work and in the hearts of all those whose lives he touched.